Hop-On the Red Double-Decker FUN bus for an entertaining, informative, flexible City Tour and visit New Orleans' most popular attractions. Enjoy unlimited Hop-On Hop-Off City Sightseeing including free walking tours, plus deals all along the way! Buses visit each stop every 30 minutes so guests can Hop-Off and spend as much time as they like before they Hop-On another bus to continue their journey. For newcomers to New Orleans or return visitors who missed out the first time, here is a full itinerary to pack in as much culture as possible in one short trip. Get ready to soak in the best New Orleans has to offer with a one or three day unlimited sightseeing pass. Hop-On Hop-Off Open-Top Double-Decker buses are rolling in New Orleans and they are a BIG hit! Hop-Off at any of our convenient stops along the tour through the French Quarter and Garden District hitting New Orleans' most popular attractions! You can always catch another bus, every 30 minutes, at any stop. 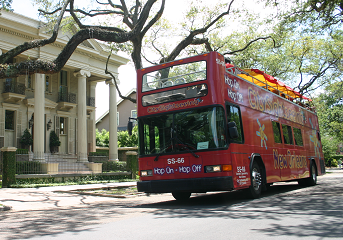 The Hop-On Hop-Off City Tour is the best way to see New Orleans at your own pace. Experienced Tour Guides offer historic and interesting commentary and answers questions.